Jane Boyle spun obligingly, her skirt flaring in a satisfying burst of green silk. She craned her neck for a glimpse of the back in the boutique's narrow mirror,but it was hard to tell what she'd look like when she wasn't twisting around like a lime coloured flamingo. This, she reminded herself, was why friends were so essential to the shopping process - especially when shopping to impress a man who was an unrepentant fan of the back view. Jane had spent every lunch hour that week hunting for the perfect dress, but by Thursday it had become clear that she needed an expert's help. But when Malcolm introduces Jane to the esteemed Doran clan, one of Manhattan's most feared and revered families, Jane's fairy tale takes a darker turn. Soon everything she thought she knew about the world—and herself—is upended. Now Jane must struggle with new found magical abilities and the threat of those who will stop at nothing to get them. Well this book really does have the mother in law from hell! Organising your wedding is hard enough to deal with, without throwing in the Wicked Witch of the West, intent on killing all your new friends who might just tell you the truth about the skeletons hiding in the diamante and gold edged cupboards of your family to be. Poor, poor Jane! She really has no idea what is going on with Malcolm's family and you feel this dread filling up your stomach as she slowly discovers the truth. I knew a little about what to expect from this book, but it was still uncomfortable finding out about the new family at exactly the same time as the protagonist did. Jane's relationship with Malcolm left me unhappy as I was so hoping for a beautiful outcome, however it does seem that blood runs thicker than water, especially if you have magic bursting through your veins. Malcolm's mother, Lynne, is like the modern day version of Cruella De Ville. There is nothing but poison running through her body; she manipulates everyone and everything to selfishly get her own way - no one else is allowed to make a decision in her family. You really wouldn't want to get on the wrong side of her, yet Jane really held her own, as she came to terms with her new found talents and explored and strengthened her own magic. She wasn't about to play the dumb and dutiful daughter in law in the way Lynne wanted; she had the guts and intelligence to take her on. I did enjoy this book and I found the plot to be very good indeed. It did dip a little in the middle, once Jane discovered the truth about Lynne, but it then soon picked up and sped to the final confrontation. The characters were interesting yet they were overshadowed, as they should be, by the powerful Lynne who ruled the book. For me, this book felt like a mix of Gossip Girl and Charmed. You had the mean bitchy society girls playing with magic. I loved the setting of the book, as Jane flitted from the cosmopolitan streets of Paris, to the American royalty region of Manhattan. 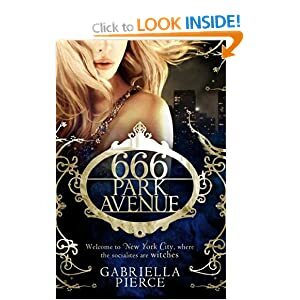 This book is full to the brim of glamour and glitz, fused with magic and power, resulting in an explosive setting for the rich and famous of New York. An excellent foundation for the series and definitely one I am looking forward to reading more about. I didn't realize this was a book! It's a new fall tele show here in the States. I was wondering what it was about. LOL.